Iknow I have said it before, but it bears repeating - you have the most gorgeous and varied projects on your stitching list! The Just Nan 12 Days is tugging at my heart, but they are all beautiful. You received some very lovely Easter gifts. First, I think the treads are just random ones I pulled because I am too scattered to think of getting floss for a chart! ;) Love Discworld Mappe! It looks fabulous. And the bunny was a Mill Hill kit. I am addicted to the things! Wonderful, wonderful stitching as always, my dear - such a pleasure to read and view your posts. Love your Easter Gifts, too. My goodness! What lovely projects you have going! I love the Just Nan pieces, they are both lovely!! Raven is going to be stunning on that fabric...wow! I have never been brave enough to buy a Chatelaine, but I have my eye on one that I absolutely love...seeing yours makes me almost brave enough...haha. Lovely stitching all the way around, and wonderful gifts, it was a feast for the eyes! What splendid GG you received! The VMSS threads are very pretty. Steph's bunny is super cute too. What's your flat ORT tin, preciousssss? I'm guessing a fancified Altoids can, a pill box, or maybe an old cigarette container... thing? Are your ORTs kept gorgeously too? As usual, I love seeing all your wonderful projects!! I agree with Elfie, great variety of projects you have. Love the cute bunnies you received and the project bag is going to be very handy. Wow, what a great GG month for you! 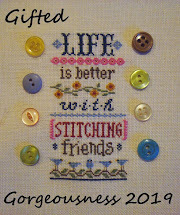 So much gift stitching has happened - I agree, the Jodyri thread on Gardens of London looks amazing! Lovely new stash as well, I'm sure you'll find a great use for the new threads. What lovely gifties you received this month! 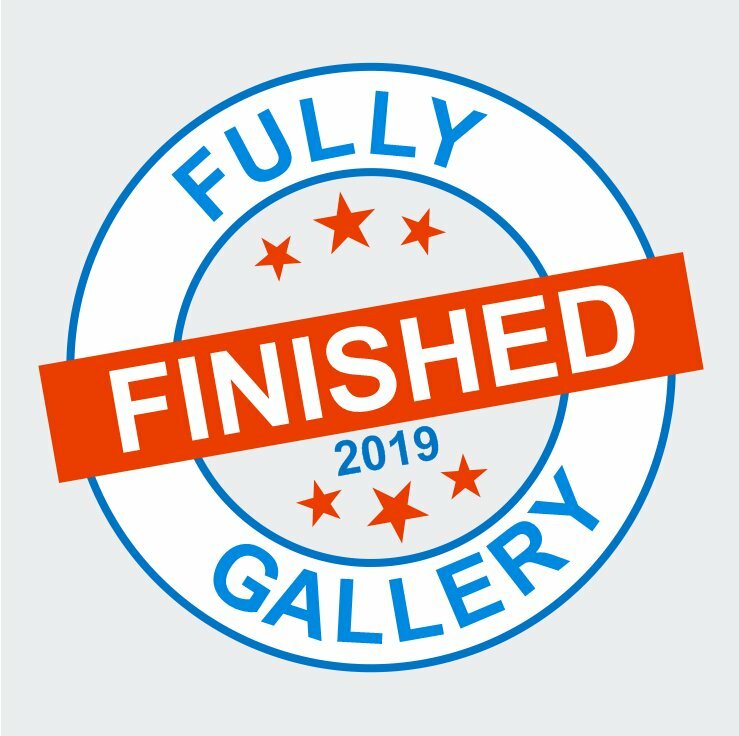 Your projects are moving right along. 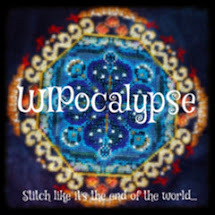 I'm loving your Discworld Mappe, and the "Nebula" fabric is out of this world. Gorgeous stitching and gifts Jo. Will you have to have a new start to fill up your new project bag?! 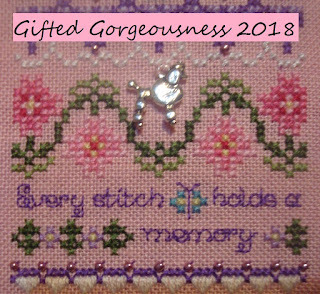 Nice stitching and lovely gifts! Great post. Lots of beautiful goodies on the received and the worked on sides. Thanks for sharing! So much great stitching to be seen here again. 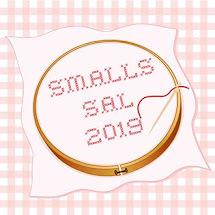 All your projects with something gifted, either the fabric or the charts or the threads, are so varied and provide a lot of stitching fun I'm sure. Now on to see what the others show in their GG posts. What lovely stitches make the pavement on the Chatelaine. Clever friend you have, a nice project holder she made you. Wonderful progress and lovely gifts Jo. Great progress, Jo! And what lovely gifts! Just to say that I'm one of those with memory issues this month. I wrote a GG post but forgot to link it. 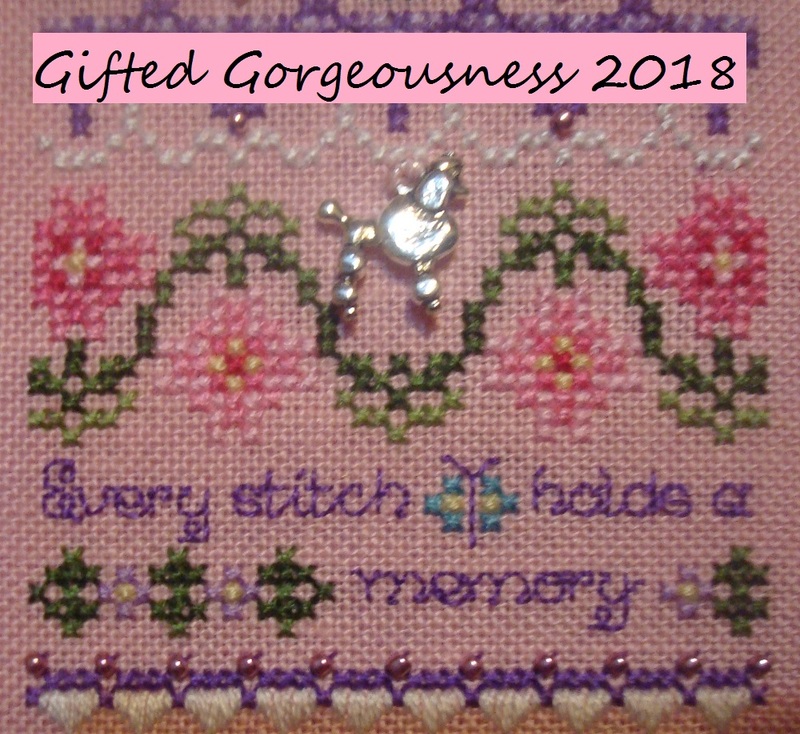 Lovely stitching as always and you received some great gifts this month. Project bags always come in useful.